In Last Night’s Scandal, Loretta Chase evokes a classic romantic theme: the unexpected transformation of a childhood friendship into a love story. Olivia Wingate-Carsington and Peregrine Dalmay, Lord Lisle, the two runaway children from Ms. Chase’s 2006 novel, Lord Perfect, have grown up to inhabit their own book. As always, her characters are vivid, multifaceted, quirky individuals who pull you instantly into their world and won’t let you go until you’ve reached the end with a sigh of regret. Last Night’s Scandal begins with an exchange of letters between Olivia and Lord Lisle. The letters brilliantly establish the characters, both for the reader who is familiar with them from Lord Perfect and for the reader who has never encountered the pair before. Olivia is the drama queen, and Lisle is the practical archaeologist. Of course, there’s far more to both of them than the obvious stereotypes. Olivia’s reaction to her grownup friend is equally powerful. Yet each believes they are the worst possible mate for the other. Lisle’s parents have driven him out of England and all the way to Egypt to escape the ongoing melodrama of their lives; he craves order and stability. Olivia longs for adventure and plunges headlong into whatever mad scheme appeals to her. The book’s title refers to the fact that her name is often linked with the latest society scandal. She is frequently sent to the country to live down her most recent disgrace. Perhaps the thinnest element of the book is the plot device that sends the two friends to a castle in Scotland owned by Lisle’s parents. The pretext is that the property is falling into ruin due to a supposed haunting, scaring away tenants and staff. Lisle’s parents want their son to restore the castle and surrounding lands to their former income-producing status; they insist that he journey there immediately. Olivia believes they are manipulating Lisle in order to prevent him from returning to Egypt where his heart lies. She wishes her dearest friend to have his heart’s desire and she herself wants to have one last adventure before she is forced to marry, so Olivia engineers events in order to accompany him to Scotland. The challenge of bringing order to Gorewood Castle shows both Olivia and Lisle at their best. Lisle motivates a group of reluctant workers to make much-needed repairs, while Olivia sets up a functioning household staff, facing down an intimidating French cook in a marvelous scene of manipulation and diplomacy. The two friends also work together to expose the very human and rather inept ghost, discovering in the process that the castle harbors a treasure that the so-called ghost is trying to steal. Readers of Lord Perfect will enjoy the echoes of Olivia and Lisle’s first treasure-hunting adventure as they decipher cryptic clues that lead to a discovery somewhat different from their expectations. Their relationship ripens into more than just sexual attraction as they come to understand the strengths each has developed in the years they’ve been apart. Perhaps one of the most moving scenes is the one in which Olivia convinces Lisle of her love by showing him the “treasures” she keeps in a special box, once again echoing the quests in both novels. It is not at all necessary to have read the first book in order to understand the second one. 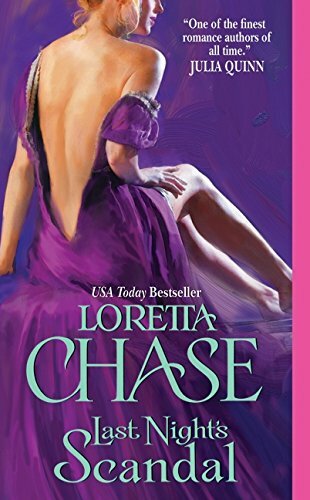 However, experiencing Lord Perfect first will enhance the reader’s pleasure in Last Night’s Scandal, especially since Lord Perfect is one of this reviewer’s favorite Loretta Chase novels. In fact, the only noticeable flaw in this sequel is the lack of a glimpse into the lives of Bathsheba Wingate and Lord Rathborne, Olivia’s mother and now stepfather, and the primary protagonists of Lord Perfect. One of the pleasures of a sequel is being allowed a chance to see our favorite characters enjoying their happily-ever-after. Alas, Ms. Chase gives us no entrée into the couple’s life after the first book’s conclusion other than as it pertains to fleshing out Olivia and Lisle’s backstory. This is a mere quibble, however, compared with the joys of Ms. Chase’s assured writing, her ability to evoke a deep emotional connection with the characters, and the sparkle of her dialogue. Last Night’s Scandal is a worthy successor to the brilliant Lord Perfect. Nancy Herkness is an award-winning author of romance novels. Her articles have appeared in RT BookReviews magazine. She is a member of Romance Writers of America and Novelists, Inc.